​ Paul Jensen, Community Development Director. Take a moment to read this succinct summary of past Downtown planning. There is much development pressure on the City, and the Mayor's Downtown Design Committee is hammering out guidelines to steer how the City will look, with hopefully "Timeless" design. Mayor Gary Phillips in a conversation with the FSRN Board at the November meeting. 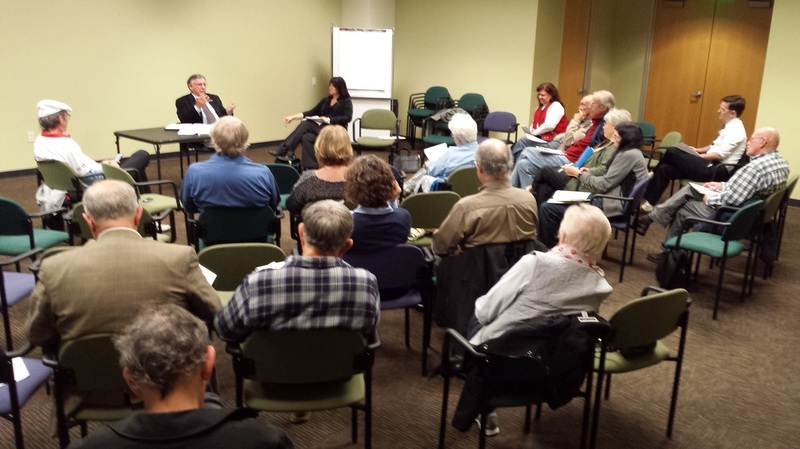 Topics included the latest on SMART, homelessness, massage parlor reductions, Ritter House, community outreach. On May 16th, 2015, the Federation of San Rafael Neighborhoods presented a $1500 grant to Marin Releaf to provide funding for the planting of trees in the city. The check was received by San Rafael resident Sandra Sellinger who heads the organization. The origin of this grant was in 2008 when the City Council established a Tree Advisory Committee to advise the city on the existing and possible future street trees, (which it was having increasing trouble funding). Since that time due to budget tightening, the City Street Tree program suffered and efforts for progress are challenged. The original funding offer of $1500 from Steve Patterson of the Federation was incentive to the City Council for the formation of the Tree Advisory Committee. The Parks Department of San Rafael Public Works and Sandra worked out the details after the Committee’s work was completed. Marin ReLeaf must find funding for each year’s plantings since they do not receive money from the City.